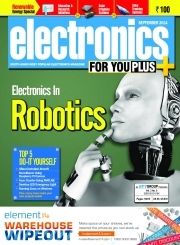 Description of "Electronics For You, September 2014 (eBook)"
The September 2014 issue of Electronics For You not only brings to you the Electronics in Robotics but also a special section on electronics in renewable energy. EC6611- COMPUTER NETWORKS LABORATORY by Mr. RajKumar K.K. Reviews of "Electronics For You, September 2014 (eBook)"